Elves. gnomes. small trolls, brownies, leprechauns and other little people are de[icted here in captivating illustrations by well-known children's book artist John O'Brien. Brimming over with whimsy and originality, the 25 illustrations also feature such delightful creatures as Rumpelstiltskin (Grimm), Thumbelina (Anderson), the people of Blefuscu (Swift), the Jumblies (Lear), Henry Hudson's crew (Irving), and Oberon, Titania and Puck (Shakespeare). Children will naturally enjoy these appealing drawings, while adults will find them both amusing and artful - Mr. O'Brien's manner is strongly reminiscent of Hieronymus Bosch and Pieter Bruegel the Elder. "Faeries" explores a whole new world -- a world of magic charged with the wild beauty of creatures who do not live by human rules. Theirs is a realm of wonder, exquisite delight, & enchanted danger. The authors, who are gifted artists, have made a study of the history of Faerie. Going to old sources, they examined the myths & legends, sorted fact from fancy, & finally, illuminated their findings with nearly 200 extraordinary drawings & full-color paintings. Rarely have research & artistry combined to produce so beautiful a result. This book is an enchanting feast to revel in, to dip into for instant refreshment again & again. Oversized Hardcover with 185 illustrations including 147 plates in full color. A gift set of 10 mini activity and fun booklets, all with the theme of fairies, for kids. Included in the collection are: a Fairies notebook with blank lined pages, a Fairy Sticker Paper Doll, 12 Flower Fairies Bookmarks, 6 Flower and Fairy cards, Fairies and Elves Stencils, Fairies Stained Glass Coloring Book, Flower Fairy Stickers, Fairyland Sticker Activity Book, Fairies and Elves Tattoos, and Elves and Fairies Stickers. Children will love coloring these delightful renderings of fairies frolicking in a rich garden of beautiful flowers. As they do, they'll also learn to recognize and identify a host of fmiliar florals: azalea, bluebells, columbine, daisies, foxglove, gladiolus, lilacs, nasturtiums, tulips and more. Exquisitely drawn by illustrator Darcy May, the illustrations feature a troop of enchanting young sprites in a variety of carefree poses - snuggled among the petals of a blossom, relishing the scent of a lilac, swinging from a vine and more. To help build and reinforce alphabet skills, each illustration incorporates the first letter of the flower's name. 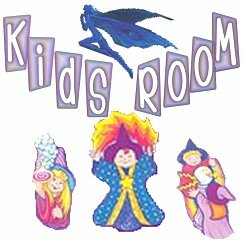 A fantastic activity book by a well known Wiccan High Priestess, designed specifically for Pagan kids. Filled with wonderous puzzles and mazes, ritual information and Wiccan lore. A fabulous tool for learning about the Pagan heritage while having a good time. Fun for both adults and children! (This is the best book of it's kind. I was tempted to teach new coveners with it.) Paperback, 36 pages. This wonderful little book for children is the story of how Herne the Father became Herne the Hunter. Within the story itself, guidelines are woven on the necessity & obligation humankind has to honor the Earth & all living creatures. A timely story that never loses its meaning. 60 pgs. Eight-legged creatures related to insects, spiders are known for the silken webs they weave to catch their prey. Youll meet 12 different species in this little book, among them the spitting spider, pyramid orb-weaver, daddy longlegs, Apache jumper, black-and-yellow argiope, Goliath tarantula, & black widow. Each easy-to-read page tells you about a different spiderits physical characteristics, habits, & other data. Theres also a blank space on the page to place an appropriate full color sticker illustration. 12 full color stickers on 2 plates, 4 1/16" x 5¾".